Dozens gathered to celebrate the Honorees of the 2015 HEROS AT WORK, Veteran Awards presented by the Tampa Bay Business Journal. Accelerated Waste Solution’s own, Fred Tomlin, was an honored recipient for his 8 years of Military Service. AWS is a Veteran Preference Employer, and a strong supporter of Veteran Advocacy. Tomlin’s military service started in August of 1996 as an Active Duty, U.S. Army soldier. An early volunteer, Tomlin spent his 18th Birthday in Basic Training. Tomlin served as an 11-Bravo Infantryman in the 1-4 Infantry Regiment, Hohenfels, Germany from 96’-98’. Tomlin was then assigned to the prestigious 101st Airborne Division from 98’-00’. After 4 years of active duty service, Tomlin served an additional 4 Years in the Florida Army National Guard from 00’-04’. During his service Tomlin earns the enlisted rank of Specialist. His military awards include, 4 U.S. Army Commendations, Air Assault Certification, the Expert Infantryman Badge Certification, as well as, numerous other accolades & recognitions. 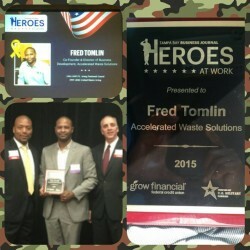 Accelerated Waste Solutions was started in 2010 by Fred Tomlin Jr. & Sherrod Hunter and is a national leader in niche Waste & Recycling Services. AWS is the home of the Industry’s & the U.S.A.’s ONLY Junk Removal App, called JUNK SHOT! Tomlin devised and spearheaded this patent pending app technology which allows users to take a smartphone photo of any junk or trash, to receive a near instant Junk Removal Quote. Tomlin also serves as the Director of Operations for AWS’ National Apartment Doorstep Trash/Recycling Collection division (Doorstep Details), which currently operates in 9 States throughout the U.S. AWS Mgmt. was awarded the 2013 Tampa Bay Minority Enterprise Development Business of the Year for exceptional community leadership. AWS is actively involved in several Apartment Associations locally and throughout the U.S. AWS also participates readily in civic and community events that increase quality of life for apartment community residents. In addition, Tomlin is an active member of the Pi Iota Chapter of OMEGA PSI PHI FRATERNITY. INC. Omega Psi Phi is a local and national leader in community involvement. Tomlin was also award the 2009 Omega Man of the Year Award, by the Pi Iota Chapter of OMEGA PSI PHI FRATERNITY. INC for exceptional community leadership.